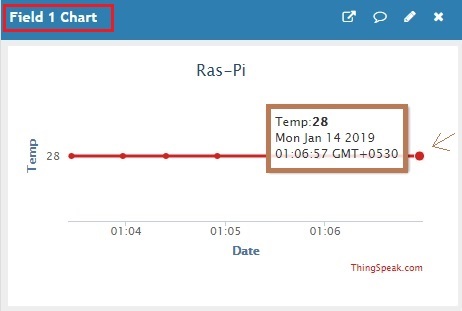 In this IoT article, we will use a Raspberry Pi and ThingSpeak to analyze the temperature and humidity. In this IoT article, we will use a DHT11, Raspberry Pi, and ThingSpeak to analyze the temperature and humidity. ThingSpeak allows you to aggregate, visualize, and analyze live data streams in the cloud. ThingSpeak provides instant visualizations of data posted by your devices or equipment. Execute MATLAB code in ThingSpeak, and perform online analysis and processing of the data as it comes in. ThingSpeak accelerates the development of proof-of-concept IoT systems, especially those that require analytics. You can build IoT systems without setting up servers or developing web software. Set up the DHT11 humidity sensor on the Raspberry Pi. Download the Adafruit DHT11 library. In the terminal, type the following command. Navigate to Adafruit_Python_DHT directory (folder). Run the following commands in the terminal. To install the library, in the terminal, type the following. Navigate to the example folder. Replace the following demo code. 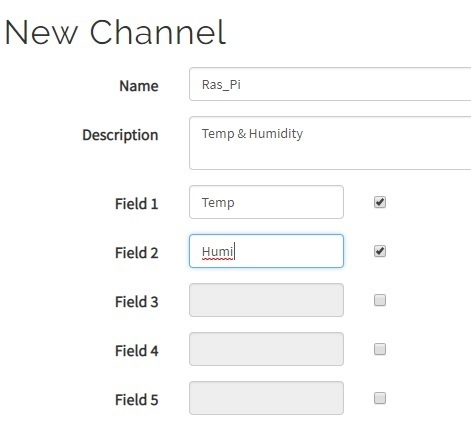 Create a new channel and select field 1 and 2. Select Ras_Pi channel and API Keys. Get the Write API Key or generate the new Write API Key. Open new Python file and name it as dht1234567.py like below. Download all of this Channel's feeds in the CSV format. Finally, we have successfully created a graph that live-streams the data in the cloud with Raspberry Pi and ThingSpeak.